Journal entry is the go-getter in Accounting. Anything and everything in Accounts can be done through a Journal Voucher. Let’s see some of the important transactions that require a journal entry. Any business purchases few fixed assets for smooth functioning like Computers, Office Space, Printers, Servers, Trademarks, etc. Such transactions are recorded through Journal Voucher. A fixed asset is used for more than one year. Hence, you cannot buy a fixed asset that has a useful life of say 5 years, and expense it out in year 1 itself. The expenditure on the same needs to be bifurcated and spread across the life of the asset. The same is done through depreciation. 3. Taxes ledger adjustment entry. There are different kinds of taxes levied in India, and while closing the books all the ledgers are adjusted against one another to come to a single payable amount. 4. Discounts, Writing off balances, and other adjustments. Many a times, you have to give discounts to your loyal customers, or write off old outstanding balances. Such transactions happen through JV. 5. Below the line expenses like Payment of Income Tax, Dividend Declaration, Deferred Tax, etc. The income tax you pay on your profits is not an expense. The same needs to be recorded as an below the line expenditure, through the journal entry. It is deducted after calculating your net profits, as an appropriation. At times, you incur certain expenditure in a particular year on credit bases, but make the payment for the same in maybe, next year. Such expenses are recorded as provisions, passed through Journal Entries. All that extra money lying in your current account earns zero interest. Smart people invest the surplus, and the same is recorded through a JV. 8. Returns/Losses on Investments, like Accrued interest, etc. Certain investments carry risk. The loss, or the gain on such investments is also accounted for through a journal voucher. One of the most popular methods of financing is borrowing. The same can be accounted for through a journal voucher. 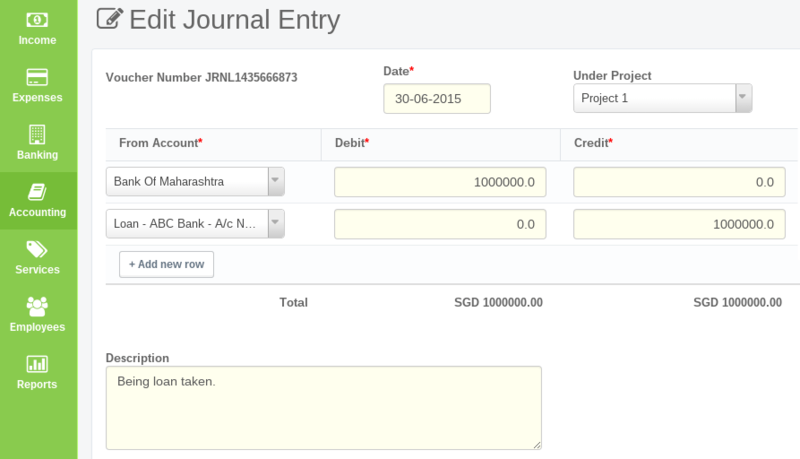 See how to record loan transactions using journal entries. Owners or co-founders keep investing in their own businesses during early stage of their startup or even at later stage. It is very important to account for the same using a journal entry. See how to record owner’s contribution in business using a journal voucher. Once you get the helm of basics, the whole accounting can be done through journal entries.